First of all, just an apology for taking so long to review this one. It has been a hectic three weeks, as I have just moved into my first home. As you can probably guess, this is a long process of settling in, and as of yet I haven't had as much time to sit down and read as I used to have. As for Birdsong itself, I picked this up because I had previously read it in high school, but couldn't really remember it terribly well. I remembered snatches of it, and have found reviews to be generally positive, so I found myself wondering if I would enjoy it the second time around. Birdsong follows Stephen Wraysford, a strange and intense young Englishman, in the years of the First World War and those immediately preceding it. The narrative starts with his passionate and scandalous affair with the wife of his host whilst visiting France on business. Following that are the years spent in the front line of the Western front and his growing apathy towards the war effort. Additionally, there are sections set in the late 1970s, with Stephen's granddaughter attempting to piece together his life whilst also trying to deal with her complicated affair with a married man. 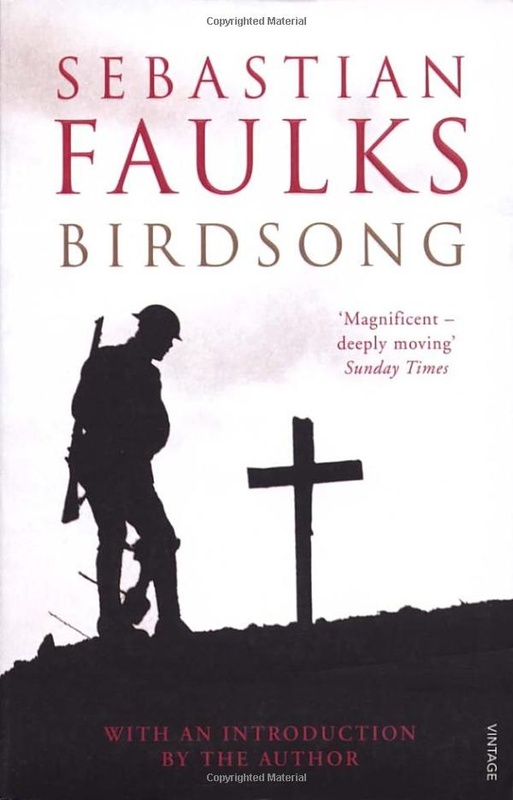 Re-reading Birdsong, I realised why I could only remember parts of this book. It is somewhat uneven in tone and quality. The narrative can be roughly divided into three strands, all of which have their own separate issues. The first is the pre-war section, with the focus on Stephen's affair. This is by far the best part of the novel, with an engaging and intense affair between two very suppressed, unhappy people. The second strand is the 1915-1918 period, which I found to be mostly positive, but not as engaging as the pre-war strand. While the mood is appropriately grim and deeply uncomfortable, I found it made less impact than it possibly could have done, because while the slaughter of trench warfare is very well expressed, it's difficult to keep track of the cast of characters when almost none of the average soldiers get character development beyond being given a name. While the sheer amount of bloodshed and the awful living conditions are impressive and sobering to read about, it lessens the impact when it's happening to a cast of cardboard cutouts. The third strand is the 1970s section about Stephen's granddaughter Elizabeth, and honestly it's a complete waste of space. If there is a particular era of films that I remember disliking from my university studies, I found that they all seem to have been made in the 1970s. There's something about that decade that lends itself to ennui and a conscious level of detachment, and it's really quite grating to me. In terms of the plot itself, it's only really relevant in its penultimate chapter, where you get some closure in regards to what happened to Stephen after the war. As for the rest of it, it follows a woman who has by all standards a wholly uninteresting life. Sure, she's having an affair with a married man, but compared to her grandfather's affair it comes off as boring, because no-one seems to want to upset the status quo. Her quest to piece together Stephen's life could have made a good story by itself, but here we know far more about what she's researching than she does for pretty much the entirety of her plot. It was an exercise in wordcount padding.